2 Stolen Van Goghs Recovered By Anti-Mafia Police In Italy : The Two-Way The two paintings — of a seascape and of a congregation at a church — were stolen from the Van Gogh Museum in Amsterdam in 2002. "They are the real paintings!" a curator said in a statement. 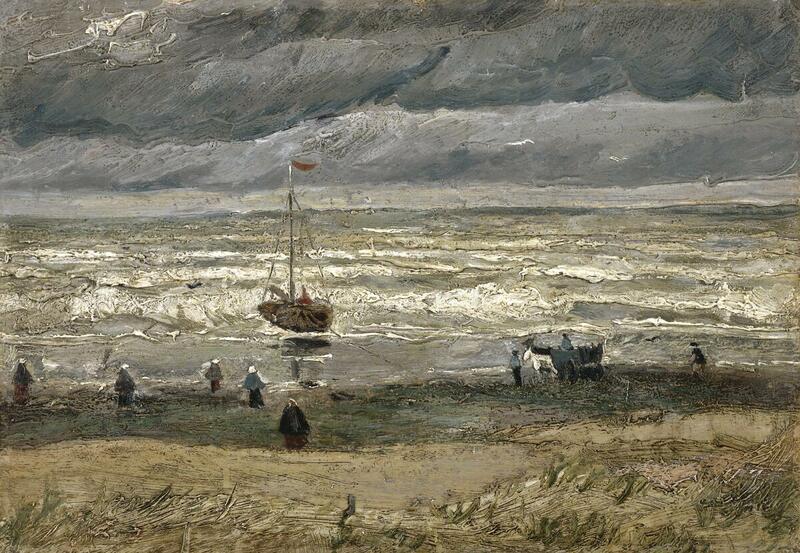 Van Gogh's Seascape at Scheveningen, 1882, was stolen from the Van Gogh Museum in Amsterdam in 2002. Anti-mafia police in Naples, Italy, have recovered two paintings by Vincent van Gogh that were stolen from a museum in Amsterdam more than a decade ago. The Van Gogh Museum announced Friday that a curator inspected the two works, at the request of Italian authorities, and "drew a firm conclusion: 'They are the real paintings!' "
The two canvases, a seascape and a painting of a church, were stolen from the museum in 2002 in a widely publicized heist. They've been missing ever since. The director of the Van Gogh Museum, Axel Rüger, said the museum owed a debt of gratitude to Dutch and Italian authorities. "The paintings have been found!" he said in a statement. "That I would be able to ever pronounce these words is something I had no longer dared to hope for." The Associated Press reports that the paintings were found during a raid of the Camorra crime clan as part of a crackdown targeting cocaine trafficking. The "priceless" paintings and tens of millions of euros worth of property were seized by police. The paintings had suffered some damage but appear to be in "relatively good condition," the Van Gogh Museum said. The paintings were stolen in 2002. A report in London's The Independent that week described a bold theft — burglars climbing a ladder to access the roof, smashing a reinforced glass window with a hammer or an ax and dropping into the heavily secured museum shortly before 8 a.m.
Van Gogh's Congregation Leaving the Reformed Church in Nuenen, 1884-1885, was one of two paintings recovered by Italian anti-mafia police, the Van Gogh Museum announced Friday. An alarm went off as soon as the window was broken, but the thieves snagged the paintings and shimmied down a rope to the street before security could reach them. Police had "no leads" at the time, the Independent reported. Investigators were "baffled" that the burglars evaded infrared systems and cameras to escape without a trace, the BBC said. The paintings in question aren't among Van Gogh's most famous, but they have huge "art historical" value, the Van Gogh Museum says. Seascape at Scheveningen, painted in 1882, is an early work and one of only two seascapes that Van Gogh painted while he was in The Hague, the museum says. 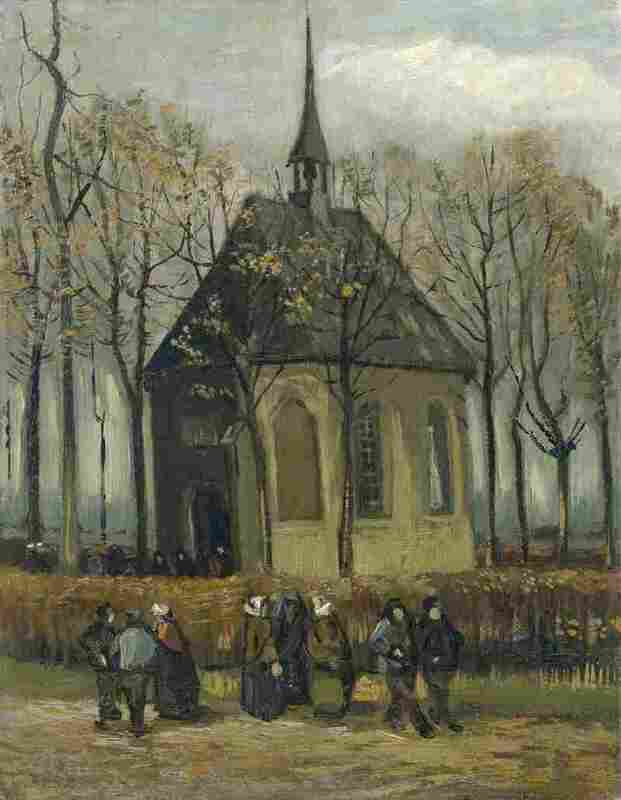 Congregation Leaving the Reformed Church in Nuenen is the only painting in the Van Gogh Museum's collection still in its "original stretcher frame," which is covered in splashes of paint that appear to be from Van Gogh cleaning his brush. Van Gogh painted it in 1884 for his mother, and added churchgoers in mourning garb in 1885, after his father's death. "The strong biographical undertones make this a work of great emotional value," the museum said. It's not clear what will happen to the canvases, but Rüger says he hopes they will eventually return to the museum in Amsterdam, after the Italian police investigation ends.